In the early days of dive computers, uploading dive data to a personal computer wasn’t even on the radar. My first dive computer was an Oceanic Datamax Sport, a solid computer that was compact, easy to read and simple to operate. It would store quite a few dives, but didn’t provide a means for exporting them. After literally decades of logging my dives in paper logbooks (almost 3,500 dives, in fact), I finally bought a SubGear XP10, which made it possible to upload dives to a PC. 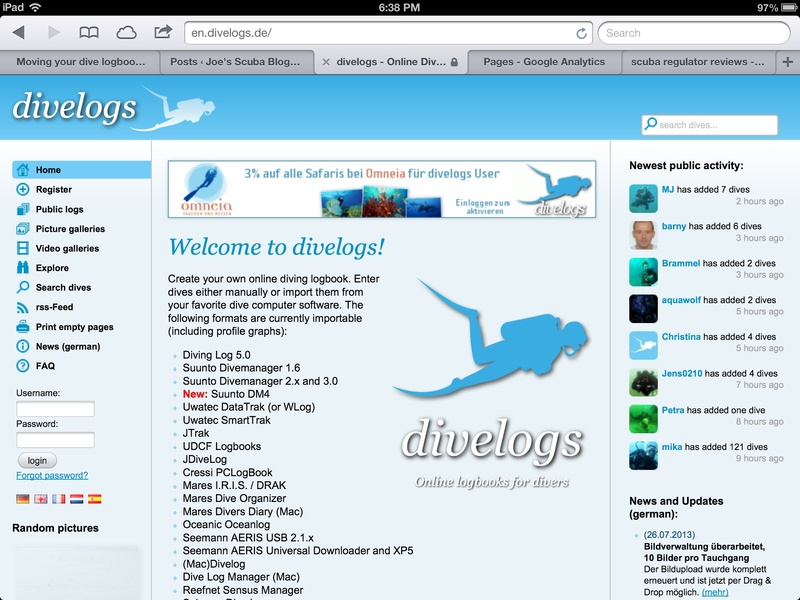 That issue resolved, I’ve taken a great interest in logging dives online. First, I just think it is fun to be able to share dive profiles, dive site and location information and notes about equipment, conditions, sightings, etc. with divers from around the world. More significantly, it forces dive computer manufacturers to conform to standards or risk being displaced by computers that make it easy to upload data to any platform their customers wish. 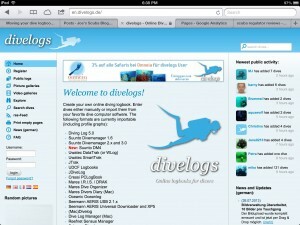 I’ll focus on what I think are the three best online dive logging websites: divelogs.de, PADI ScubaEarth and DiveBoard. I maintain profiles on all three, so I’m not advocating for any one of these to the exclusion of the others. Rather, my hope is to encourage as many divers as I can reach to share their experiences online and help build all of these into thriving online communities. At first glance, divelogs.de looks like a project developed by engineers, which makes sense, because it is. All the functions are there. The menus make sense and the site is fast. Divelogs.de is also capable of importing dive data from just about anything. 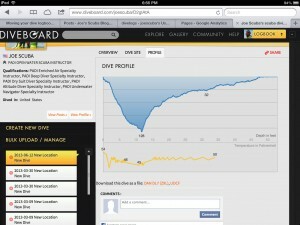 If you visit my profile, most of the dives that have actual profile data, were logged with the SubGear XP10. My most recent dives, however, were made with the Shearwater Petrel. Both live harmoniously at divelogs.de. The whole point of logging dives is to document your diving experience and to be able to recall information like weighting and exposure protection, environmental conditions, dive site information, etc. While dive computer manufacturers appear to be making incremental moves toward standardization, most are still proprietary. So, you buy a dive computer from brand X, load brand X’s software into your computer and live with it. Thanks to divelogs.de, changing dive computers is a snap. If you’re like about a zillion people, including me, your iPad or iPhone is a constant companion. Thanks to diveloge.de, you can now export your logbook into the epub format in the form of an electronic book. For travel, this means you can skip the paper logbook and demonstrate your experience like you would any other book. Between that, and PADI’s eCard, you really don’t have to carry anything else with you. I have to admit, part of the appeal of having my logbook in the form of an eBook is the cool factor. 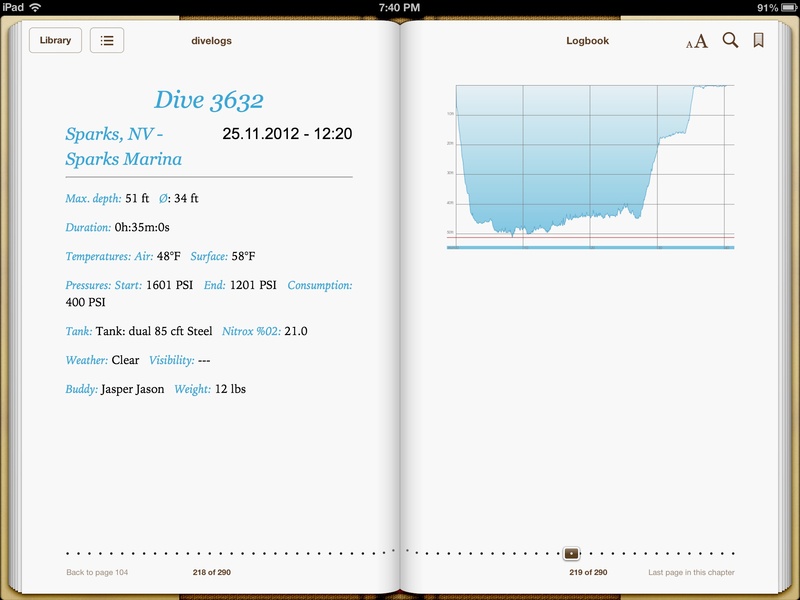 Flipping through pages of logged dives in iBooks, everyone wants to know how I get them there. The truth is I just click a button. 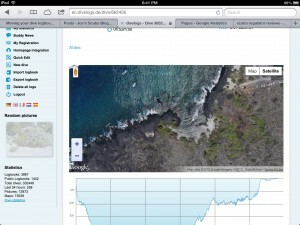 Another cool feature is the ability to map your dives. Stored with your other dive information, divelogs saves GPS data if you choose to include it. By location, once you have identified a dive site, every time you log a dive made at the same location, that information will be reflected automatically. This is not a feature exclusive to divelogs, but it is cool nonetheless. What I believe is unique to divelogs.de is the ability to export dives to Google Earth. 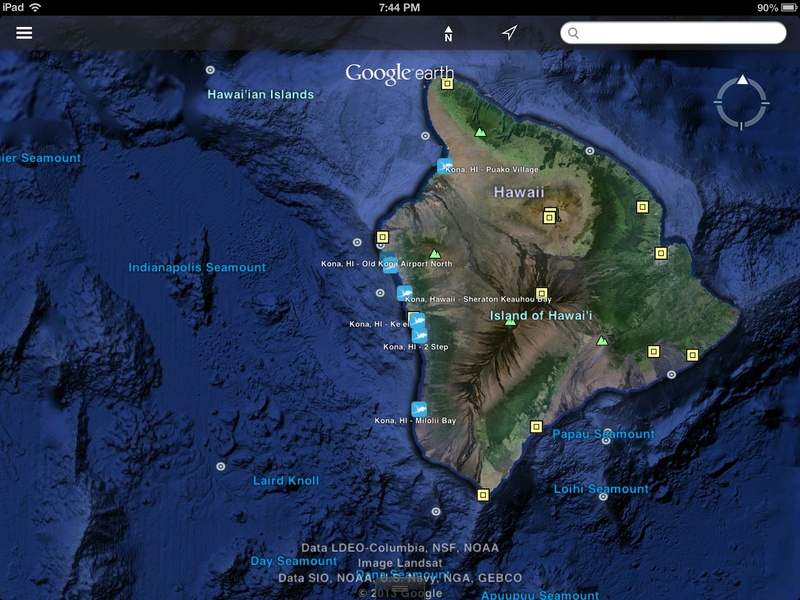 Next time I run a trip, I am excited to be able to hop from dive site to dive site using Google Earth to orient divers to what they can expect on arrival to each location. Once I have a chance to try this in front of a real group of divers, I’ll be sure to post a followup. If you haven’t guessed by now, I am a huge fan of divelogs. While it doesn’t share the high-end, polished look of the others, it is far and away more advanced in terms of function and integration. 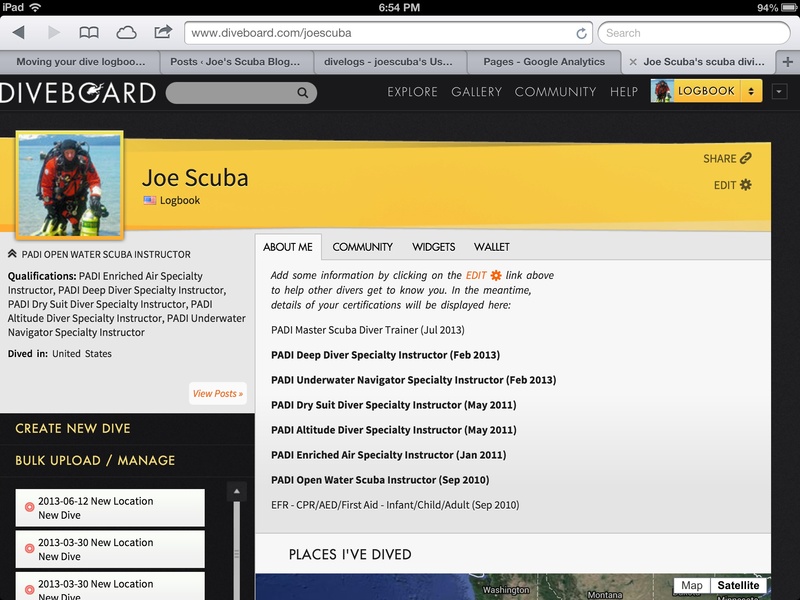 Diveboard profile page showing certifications. 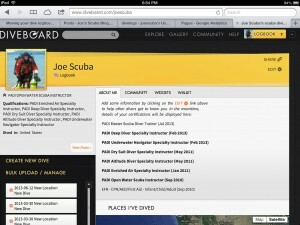 Diveboard was the first online dive community that I personally was impressed with enough to create a profile. I still like it. Some of the key features include dive logging (of course), mapping of dives, storing your certifications, diver to diver messaging, and photo galleries. I like the way all of these features function, and love the look and feel of the site. In practice, I don’t find myself actively using Diveboard like I do divelogs.de. Primarily this is because Diveboard isn’t nearly as sophisticated in it’s ability to import dives. A quick look at my Diveboard profile shows a fairly sizable collection of dives, but they lack all of the important details about location, etc. The same exact file imported into divelogs included all of that information. Diveboard also breaks on import if the planets don’t line up just right. So, while I like Diveboard a lot, and applaud the developers for doing a great job, the simple fact that I must manually edit individual dives makes it too time consuming to be practical if you have a lot of dives to add information to. Once entered, Diveboard’s dive profiles look beautiful. 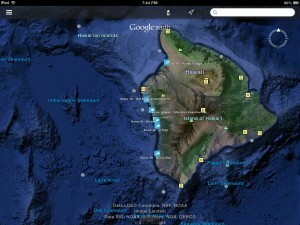 There are plenty of options for adding detail about individual dives and various locations, etc. I should mention with all of these websites divers have the option of keeping their information private, visible only to “buddies” or public. One thing I really like about Diveboard is it’s “Community.” Basically, it is a blog but has quite a following among active contributors. Topics range from preventing regulator free flows to becoming a dive instructor. There’s also a gallery, where members can post photos or browse those that have been posted by others divers. Many are spectacular, and as the community grows, Diveboard is sure to add functionality. My guess is, eventually, Diveboard will provide better support for expanded import/export options, as well as many new features even they haven’t thought of yet. 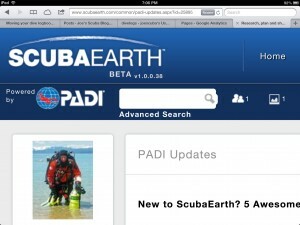 First, I can’t emphasize enough that PADI ScubaEarth is in beta. As a PADI instructor, I am included in their surveys and have a bit of insight as to what’s to come with ScubaEarth. As new features roll out, I’ll be sure to include them. In the mean time, I’ll give my opinion about the site in it’s current beta state without being too critical. The idea behind ScubaEarth is to create a global community of divers, resorts, PADI dive centers and related organizations. It is a huge undertaking and PADI is uniquely equipped to make it work. As the top certifying agency, PADI has incredible global reach, not only among certified divers, but with every manufacturer, retailer, independent instructor and others. Basic features of membership to ScubaEarth include logging dives, a growing community of members, messaging, personal galleries and a “dive locker” for storing details about your equipment. That could be very handy in the event of loss or theft. ScubaEarth also provides tons of great editorial content like featured dive destinations. It makes sense since PADI publishes popular dive magazines in addition to countless publications like books, videos, slates, marketing materials and who knows what else. Site wide, ScubaEarth provides information about dive stores and resorts worldwide, along with a very Facebook-like “wall.” All of this is very cool and done in the uber-branded, high-end way PADI is famous for. If ScubaEarth has a weak link, dive logging is it. 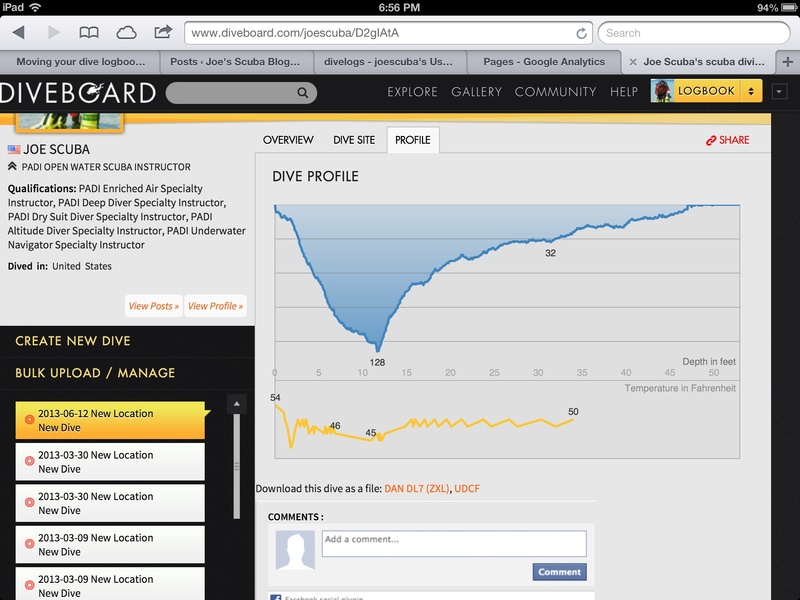 At present, dives can only be logged manually, so visual profiles are out of the question. One thing that’s nice is that you can search for a dive site and, if that site has been logged previously, location details will be provided. But, that doesn’t change the fact that dives must be logged one at a time, and for those with lots of dives, it can take hours or days to plug in all the details. I have it on good authority that PADI is looking into options, but I have no way of telling if direct data import is in the works or not. One thing’s for sure. PADI will do whatever it takes to make ScubaEarth the powerful, popular platform it invisions. First, I’d like to restate my appreciation for the developers of each of these for having the vision and commitment to bring such great websites to the diving community. If you haven’t already, I recommend you get online and create an account with all three of these websites, if for no other reason than locking up your favorite screen name. I’m sure you’ll find features in each that are worth exploring, and the more members each site has, the more motivated they’ll be to add features and increase compatibility. For me, the favorite, running away, is divelogs.de. I only discovered the site recently and instantly it’s become part of my standard dive logging routine to upload dives (automatically from SubSurface, incidentally) to the site. At the same time I log dives, I create a new eBook and save it to my iPad. It’s all effortless, with seamless ease of use that makes it feel more like a desktop application. Give them all a try and please send me your comments, and let me know about others I may not be aware of. I’ll look forward to profiling those too. This entry was posted in Dive Sites, SCUBA Gear Reviews and tagged dive computer, dive travel, diving safety, diving website, xp10. 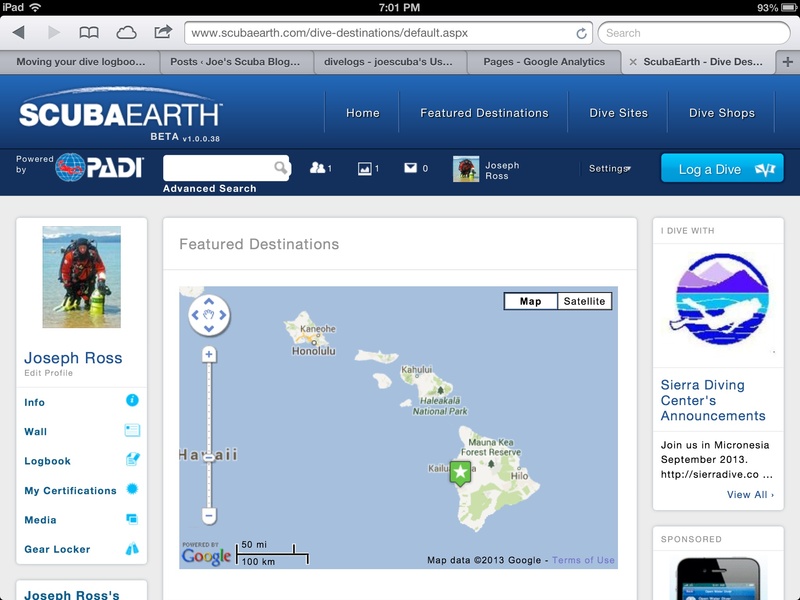 Just logged into scuba earth to log a recent dive. When I did I found that all the past dives I had logged were gone. 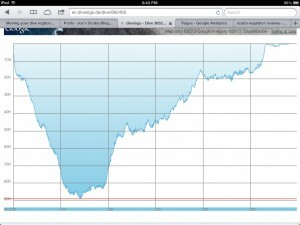 My profile now shows 0 dives. Lots of work and data gone. User beware. I’m new to diving in past 2 years. Just completed Advance Open Water. Was excited to log everything in Scuba Earth and then…wow, very disappointed in the functionality, ease of use and speed of Scuba Earth. Whoever designed it is living in stone ages. I expected 1st class app from PADI. Diviac seems to have a lot of syncing problems with their tool that reads from your computer. They are working on it but it seems to be always an issue.. i’ve been using them the most. I like their GUI the best but doesn’t do any good if I can’t sync up my data. 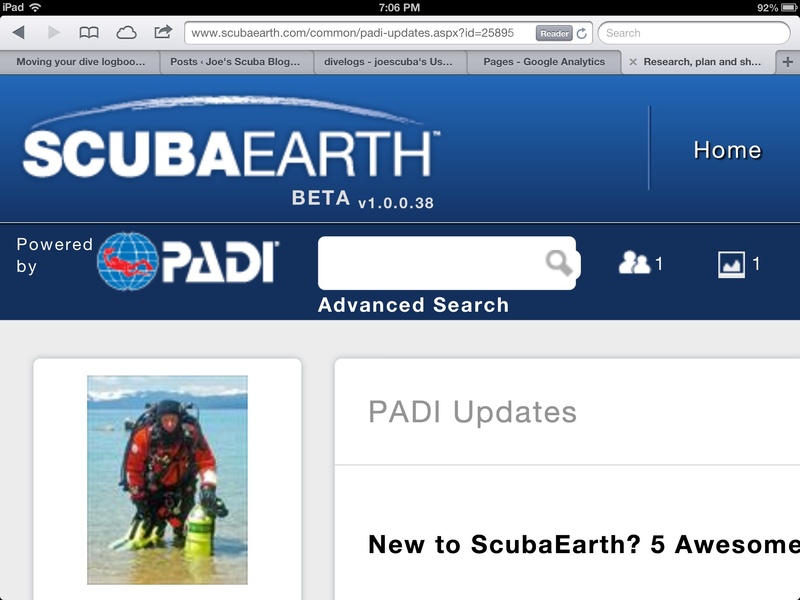 I downloaded and setup PADI Scuba Earth 3 weeks ago and have to say I find it really terrible. It’s slow, the graphic design is bad, user interface is terrible, it’s glitchy and certain aspects of it don’t work. Quite frankly whoever designed it, the UI in particular, should be fired. I’ve played around with it for hours over the past few weeks and I’m sorry to say that I really cannot find anything good about the app at all. Since I was not satisfied with any of the existing solutions in 2005. It doesn’t look as fancy as the sites you reviewed (no web 2.0), but is has most of the features of the 3 combined, and much more. One of the things most online logs lack, is support for technical divers. My logbook will allow you to enter all the gases you used, import pO2 profiles from a rebreather and show deco ceiling graph. But each online divelog site has a different approach to what is important and how easy logging should be. Nice Job! I really do wish the others would handle deco gases. Do you have plans to be able to import/display actual dive profiles? You can also try http://diveadvisor.com/ Which also has android and iphone apps, so you can take your logbook with you. I really appreciate those blogs. They are highly authoritative. 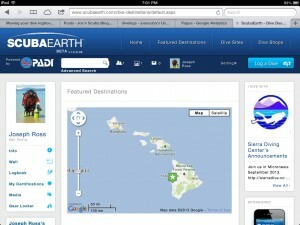 However, we should also not forget about other scuba related blog sites. Every day, another scuba related blog has been built and I know it is also authoritative. I just wanted to point out that there’s a new kid on the block, http://www.diviac.com, which was launched at DEMA in November 2013. Be sure to check out the list of features on the public pages before you sign up (it’s free) so that you get a good overview of the major differentiators vs. your current top 3.